After the success of the first Phantasy Star game, Sega continued the series by making the jump from the Master System to the Sega Genesis. Phantasy Star II was released for the Sega Genesis in 1990. And as per my custom, I'd never played the game until about a week and half ago. Phantasy Star II begins with a much more coherent bit of story than the first game. The game's protagonist is an agent of the Mota government named Rolf (if you choose to name him according to unofficial Phantasy Star 'canon'). He is plagued by a reoccurring dream in which a girl is locked in a life & death struggle with a monstrous torso. After one such dream, Rolf reports to his commanding officer, who assigns him the task of investigating the planet's computerized caretaker, the Mother Brain, which has begun to malfunction. What seems like a simple task turns into a grand journey, complete with some pretty surprising insights, plot twists, and a few unexpectedly sad moments. During the course of this adventure, your quest attracts 7 other characters you can use to customize your party. The turn-based battle system from Phantasy Star returns with a few notable enhancements. You can now fight not one, but two different types of monsters at a time. Also, the characters in your party carry out their attacks on screen. The battles have a tendency to play out faster as you only need to press one button to initiate your entire party's pre-chosen strategy, which is helpful in avoiding the unwieldy menus in the game. One unfortunate omission is the original Phantasy Star's colorful battle backgrounds; each enemy encounter transports you away from the terrain you happen to be exploring to an inexplicable blue grid. The most significant departure from the original game is the substitution of a slightly less confusing overhead view for the bafflingly complex first person dungeons that were present in original. This allows for a little more variation between the settings, and banished the indefatigable sense of being lost. Don't be fooled, though, Phantasy Star II is full of brutal dungeons that necessitate not only a large reserve of healing items but a great deal of level grinding. Phantasy Star II is a game that possesses a great deal of old-school charm. It's meaningful story, relatively amiable characters, and advanced (for the time) graphical presentation were more than enough to keep me pressing forward for 30-ish hours that seemed to pass pretty rapidly, in spite of a steep level of difficulty and a few minor flaws. 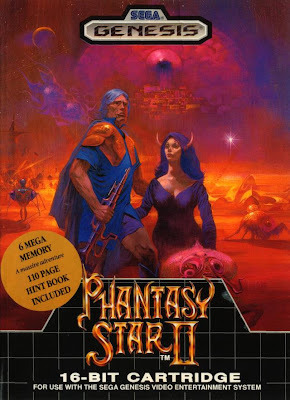 Although Phantasy Star II may have been surpassed by later 16-bit RPGs, I can easily recommend this game to anyone who wants to enjoy a game that set the bar pretty high.